To get to the starting point 부산서부버스터미널 Busan Seobu Bus Terminal 釜山西部市外巴士站 , we turned left and walked straight after Exit 5 of Sasang Station (Subway Line 2, Station Number 227). Buses from Busan to Jinhae start at 6am daily, with a frequency of 15 to 20 minutes. The queue was relatively short at the counter where we purchased our one-way bus ticket to Jinhae via cash (₩5,100 per pax, T-money not accepted). We found Berth 17 easily at 06:15, and there was no queue at all. Most of the passengers were already on board, but there were still plenty of seats available. We quickly secured seats on the right (they drive on the right side), and 5 minutes later, we were on our way! One hour later, we arrived at the Jinhae Bus Station (i.e. last stop)! First thing we did was to purchase the return bus ticket to Busan (much shorter queue in the morning), and use the toilet facilities, haha. We also took a picture of the maps pasted at the window near the entrance to the ticket counter. 10 minutes later, we were ready to set off armed with Google Maps! After crossing the road, we walked to the 7-11 and made a right turn, then walked straight all the way till we reached a triangular pedestrian crossing with food tents on our right, and Cafe Yena in front. Walk along the food tents and you will reach the circular stretch of food tents. Turn right, and continue along a quarter way along the circular path. We then made a right turn and walked straight till we reach Jinhae Station. After a few photo shots of the station, we made a right turn and walk along the path till we reached the first road. There was a huge map on where to catch the cherry blossoms. 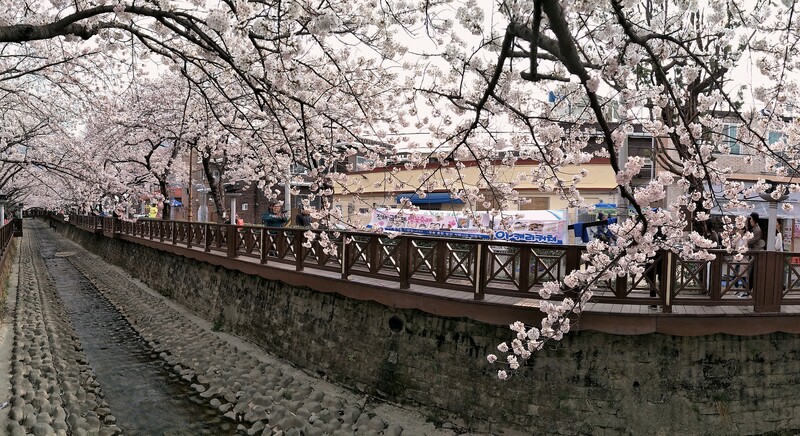 Turning into this road, we walked through a covered walkway to 여좌천-벚꽃명소 Yeojwacheon Stream (Cherry Blossom Road) 余佐川. 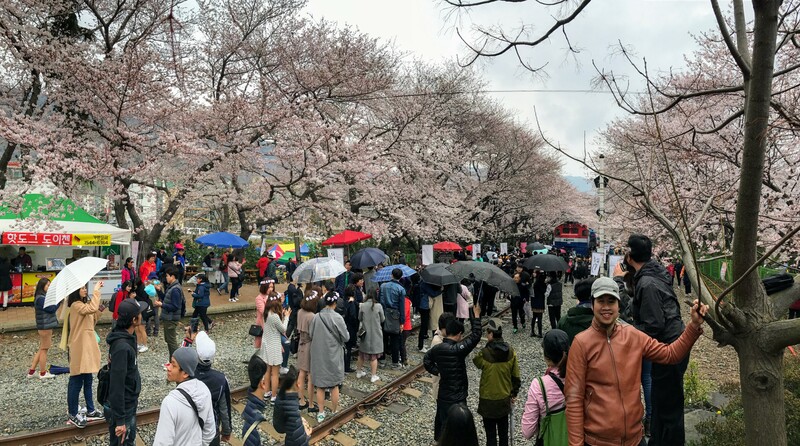 During the Jinhae Cherry Blossom Festival, no cars were allowed through this road, so it was quite safe to walk on the road itself, though we spotted a motorbike along the way. 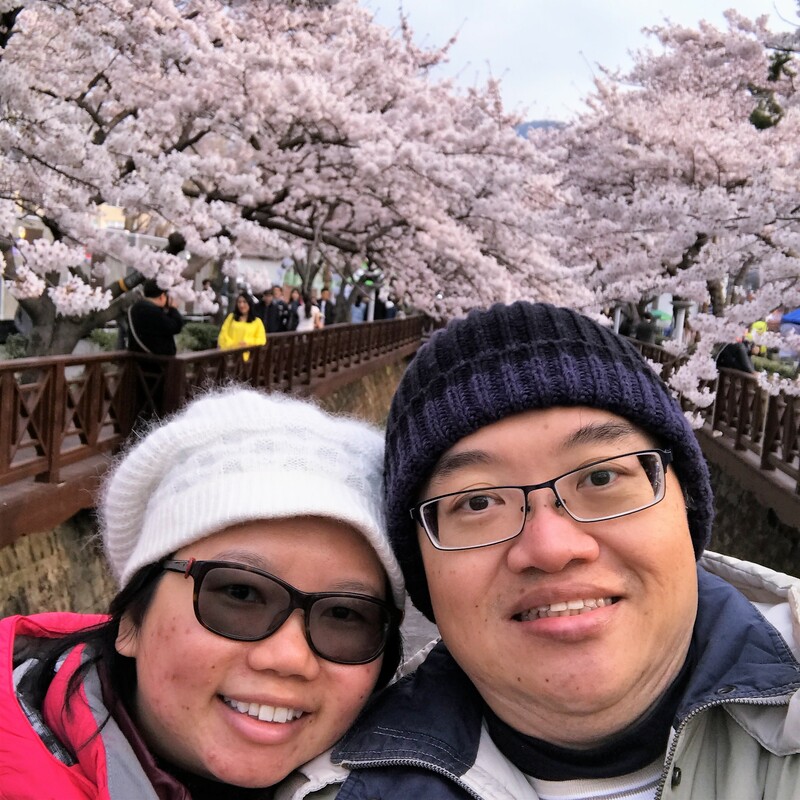 We were very fortunate that the weather was lovely when we arrived at Yeojwacheon Stream, and it was not too crowded yet. Plenty of opportunities for photos and wefies, we strolled all the way to the other side, snacking on stuff that looked interesting to us as we walked. Ah, there were quite a few bridges, and we were not too sure which one was the “romance bridge” made popular by the Korean TV drama series, but we were busy taking pictures at all the bridges, haha! 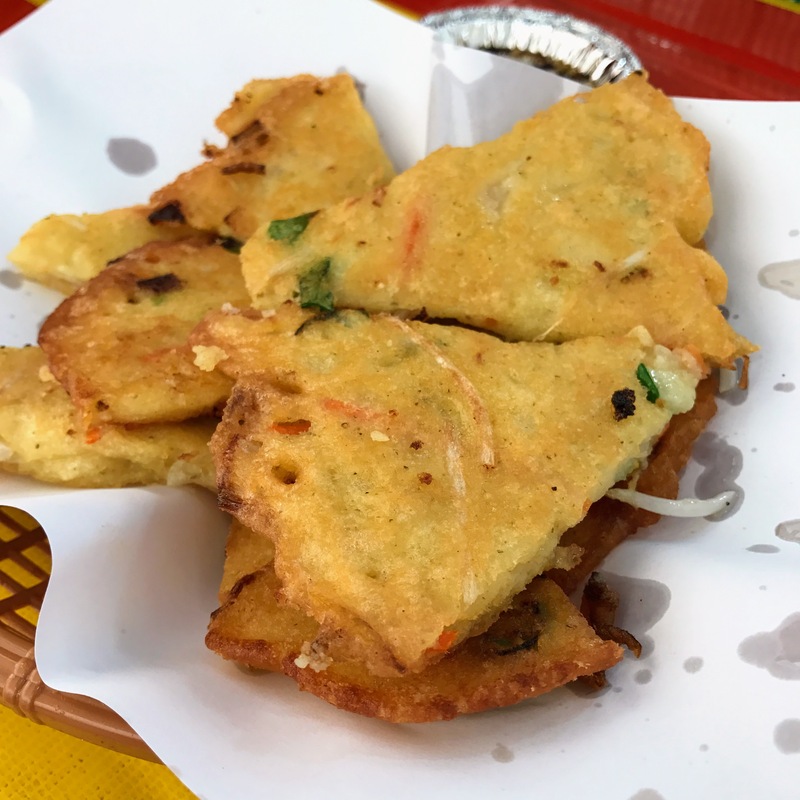 There are many variations of heotteoks in South Korea, and this version of the Korean sweet pancake had only brown sugar filling sandwiched between 2 thin crispy batter. Simple, hot, and delicious 🙂 It tasted the best when eaten hot, but be careful of getting a burnt tongue! 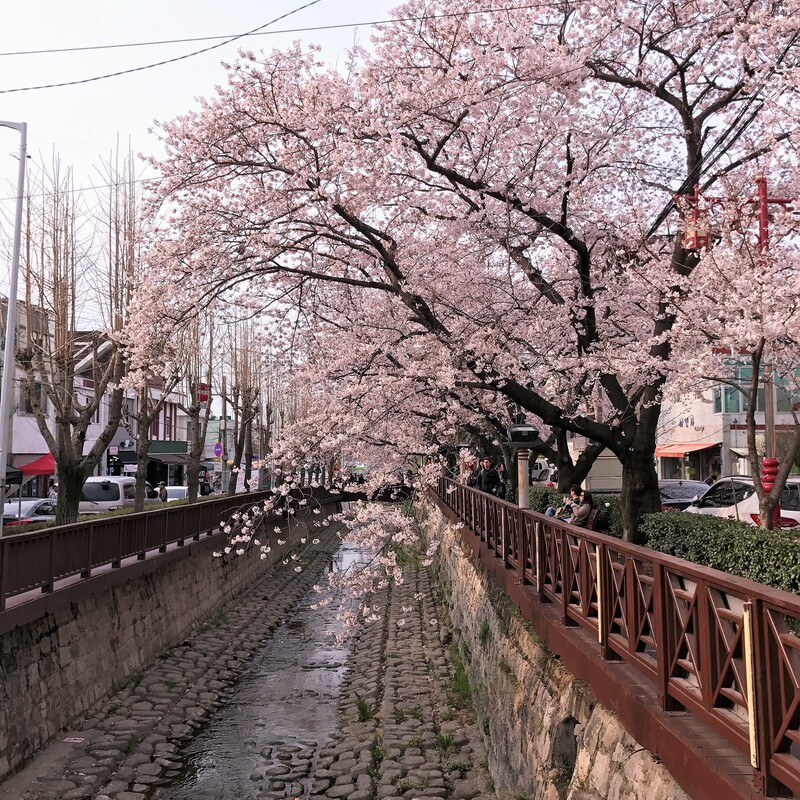 Once we reached the end of the stream, we could not find any cabs and decided to make a detour to take the bus to 경화역 Gyeonghwa Station 慶和站 for another cherry blossom site. 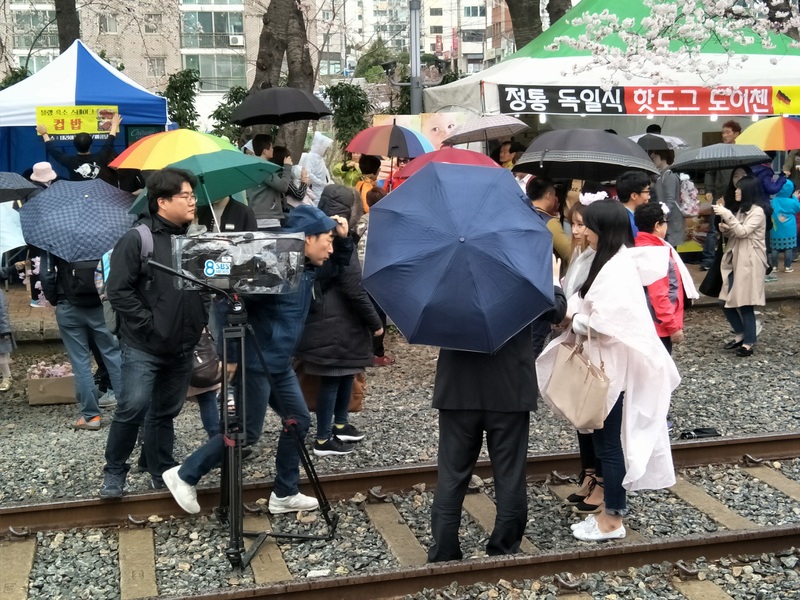 Halfway through, we were attracted by this relatively long queue for food, and got ourselves a 라면핫도그 (Ramyeon Hasdogeu) Ramyeon Hot Dog 泡麵熱狗 (₩3,000 each). 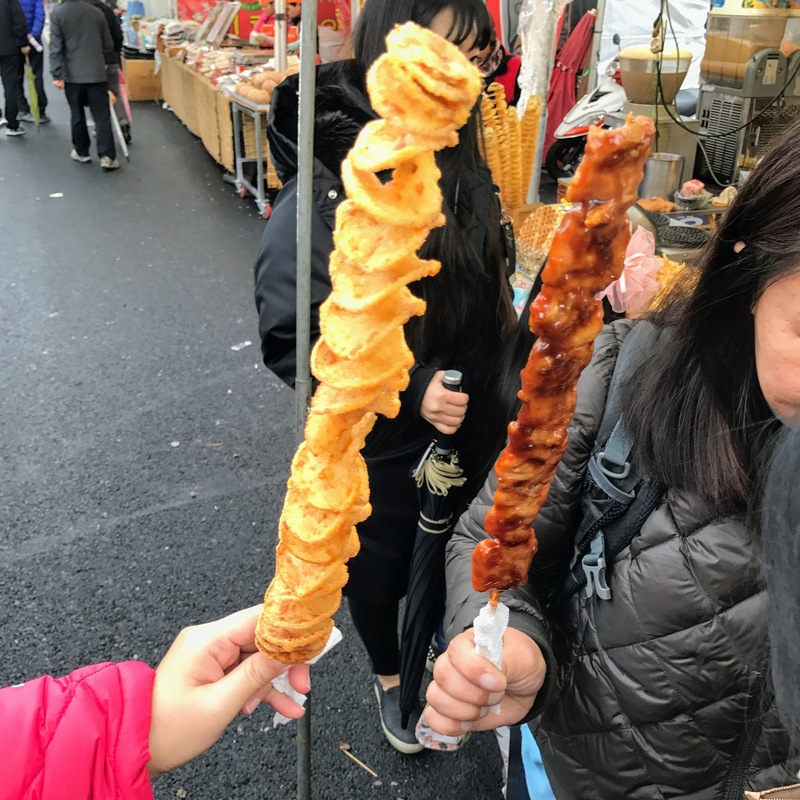 It was an interesting stick of hot dog with cheese covered with batter and encrusted with crushed instant noodles, which was then deep fried. After it was done, we could add any amount of sugar, chilli sauce, mustard, or ketchup to it. The sausage was delicious and the cheese stretched really well. The batter felt a bit cake-like, and the instant noodles reminded us of Marmee. We felt that with the sauces, it was not necessary to add sugar. 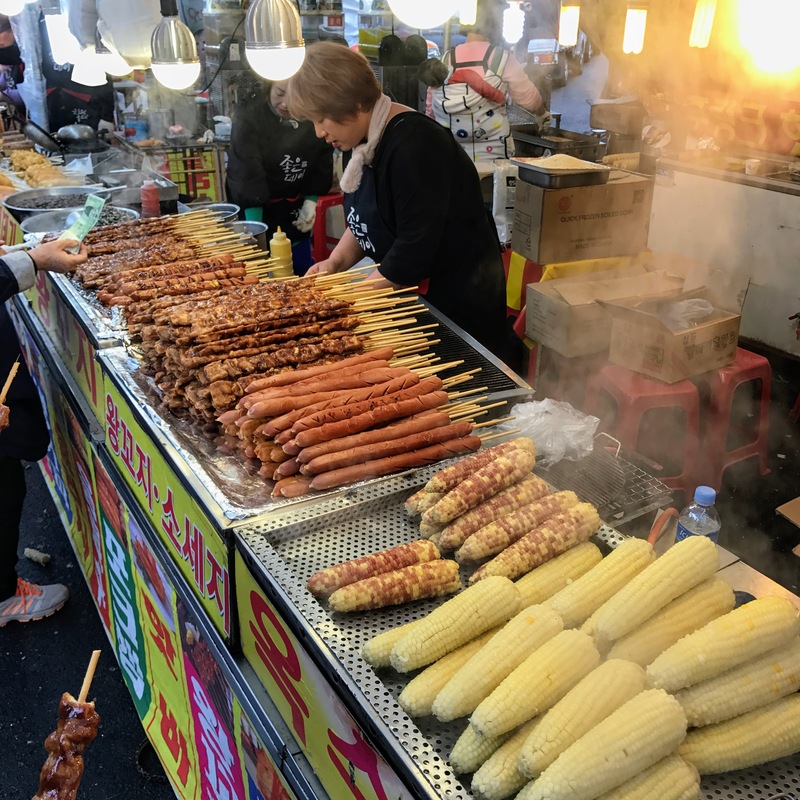 Apparently, hot dogs are very popular in Korea, and this was one of the newer variation of this snack. There was a tourist information centre nearby, and we enquired about how we could get to Gyeonghwa Station. To our pleasant surprise, there was a bus stop in the alley next to the tourist information centre, and we caught Bus 317. Ten stops later, we got off the bus stop opposite Gyeonghwa Station, and wow, it was really crowded at 12 noon! 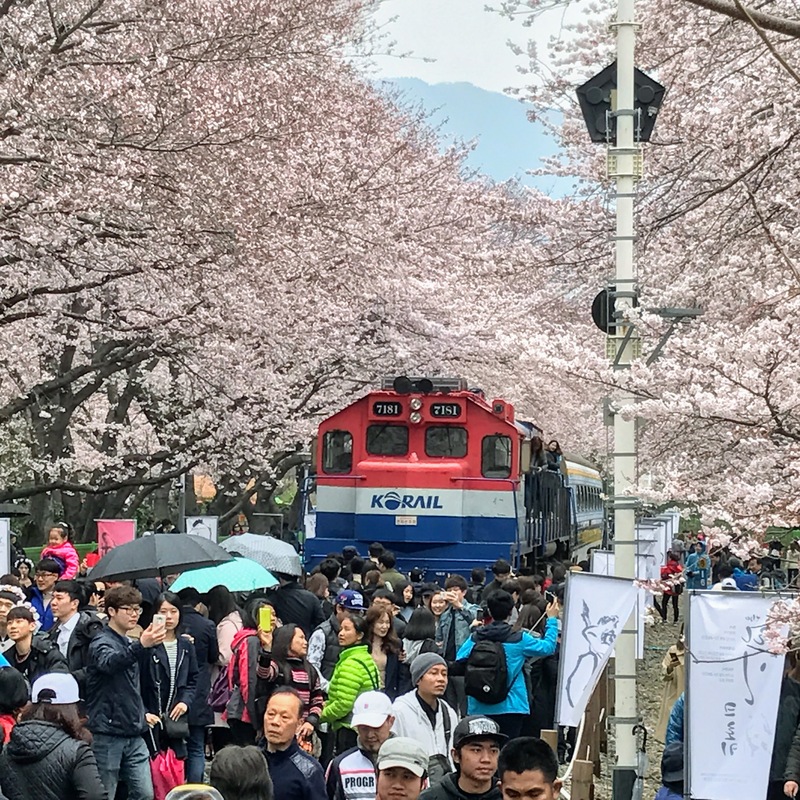 The cherry blossom trees here seemed larger, and it was a beautiful sight of the train with full blooms on both sides. As we walked along the track, we got ourselves an 계란빵 (Gyeranppang) Egg Bread 雞蛋麵包 (₩2,000 each). It was awesomely eggy, and crunchy with the sunflower seeds. The bread was soft and yummy. Of note, this stall actually used 2 eggs per egg bread, instead of the usual single egg. No wonder it was so eggylicious! For lunch, we decided to dine in at one of the tents that sold 해물파전 (Haemul Pajeon) Seafood Pancake 海鮮蔥餅 (₩15,000) and 쯕갈비 Beef Rib Barbecue 炭烤排骨 (₩30,000). We loved the slightly chewy pancake batter, and the squid was soft and tender. The ribs were pretty good too. It started pouring heavily with falling hailstones when we were waiting for the bus to return back to Jinhae Bus Station, and it was impossible for us to get up the buses, which either did not open its doors (already jam-packed with passengers), or when it did, we were no match for the local experts in boarding buses 😮 It was also not practical to take a cab due to the traffic jams, and there were no empty cabs in sight too. We also had a huge moment of panic, when Ms. W thought she had misplaced her phone, and we all went hunting for it in the hailstorm. Thankfully, she found it in her bag in the end! By then, the rain had lessened, and after enquiring at the nearby tourist information centre, we decided to walk up 1 bus stop straight ahead, which was about 5 to 10 minutes walk. It was not a bad idea, since we also walked passed a less busy public toilet and could freshen up a bit. This time, we managed to board the bus without any difficulty, and the crowd at the original bus stop had also lessened as well. 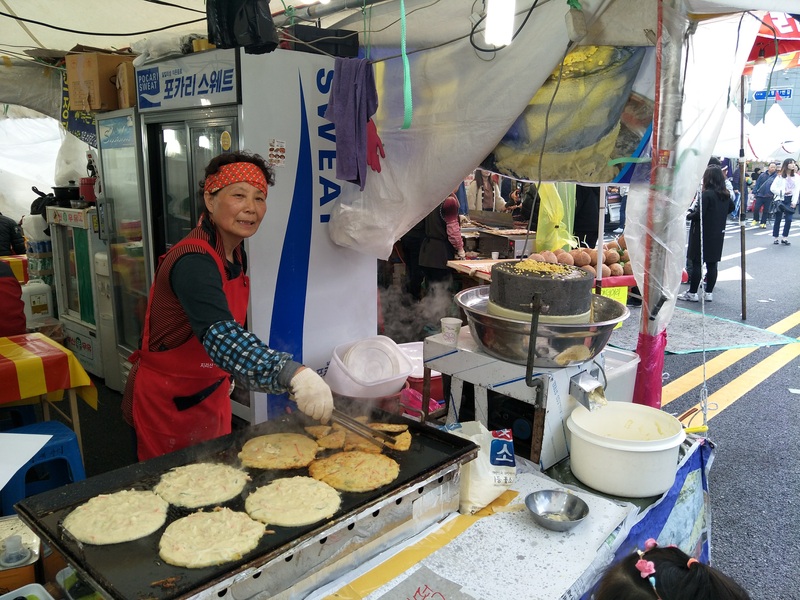 We decided to get off near the circular stretch of food tents, where we tried some super delicious 녹두 빈댇덕 (Nokdu Bindaetteok) Mung Bean Pancake 綠豆煎餅 (₩10,000). 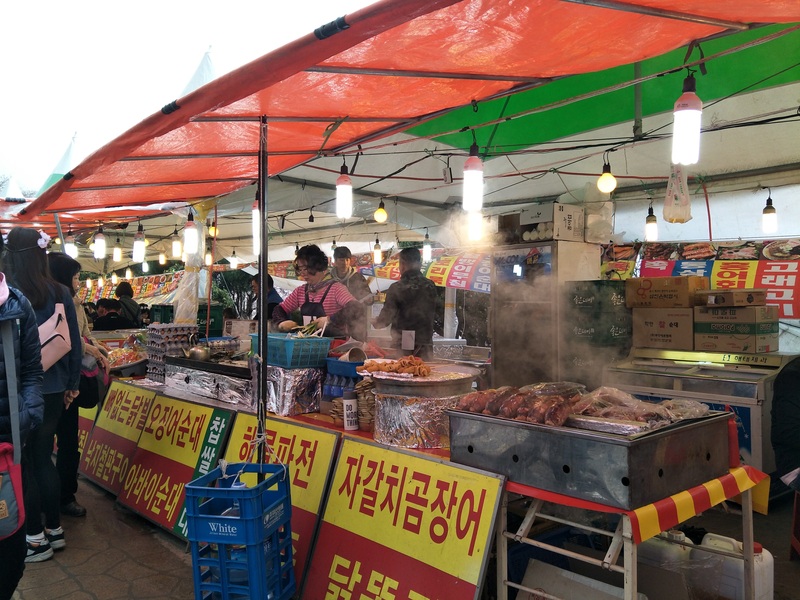 We also tried some street snacks, such as 회오리 감자 (Hweori Gamja) Tornado Potato 炸薯片(₩3,000), which was quite addictive with the cheese seasoning, as well as 닭꼬치 (Dakkochi) Spicy Chicken Skewer 烤雞肉串 (₩5,000), which turned out to be a disappointment because the meat was cold despite being taken off the grill when we ordered 😮 We also found cheap coffee (₩1,000) at one of the convenience stores, which was an excellent booster after being out in the cold all day. We finally reached Jinhae Bus Station close to 17:00, and there was a long queue for the bus back to Busan. However, we were quite lucky that a huge group in front of us wanted to travel together, and there were not enough seats for them, so we managed to get on the 17:00 bus. Journey took 90 minutes as there was a slight jam, and we ended our day with dinner back in Busan. 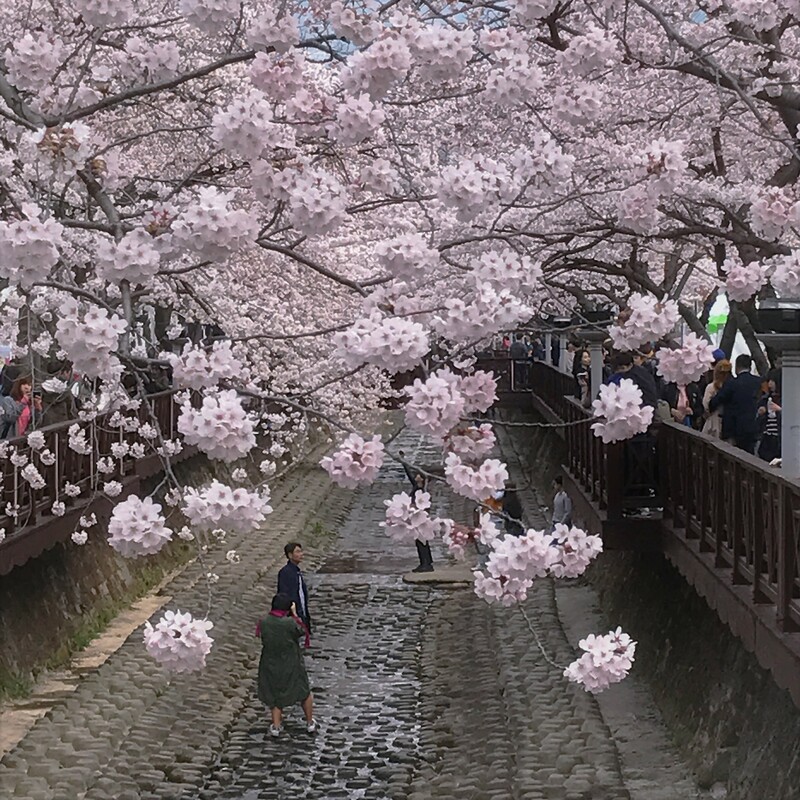 However, Jinhae wins hands down for the most beautiful and romantic stretch of cherry blossoms. 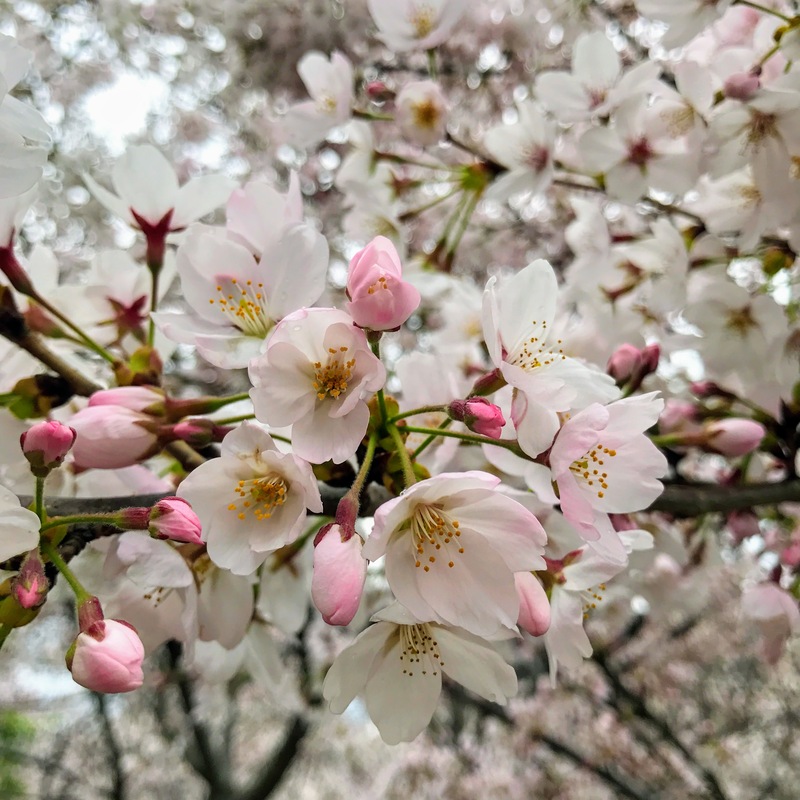 It just felt so magical, to be walking under the cherry blossoms, and enjoying the “cherry blossom rain” whenever the winds blew! Can I just check which was the date that you travelled to visit Jinhae? 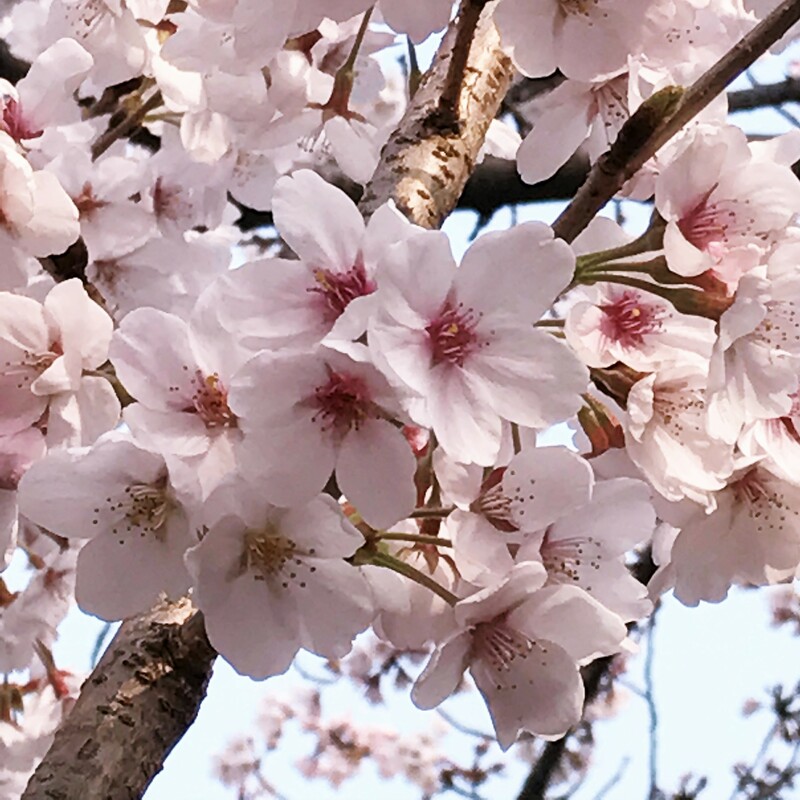 Were the flowers in full blossoms the time you reached there? Thank you so much in advance. 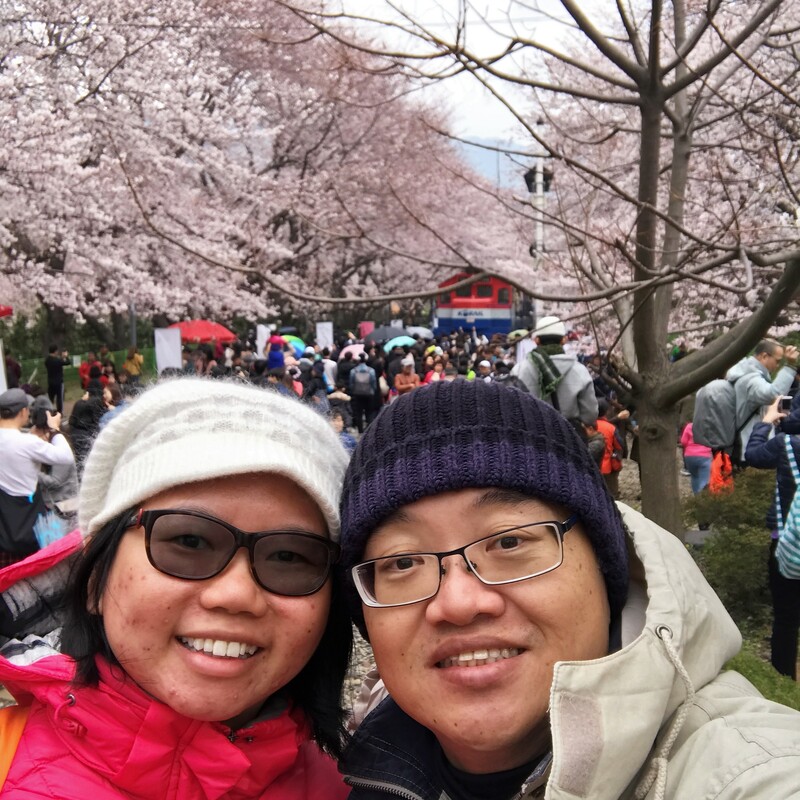 We were in Jinhae on 1 Apr 2017 and the Jinhae Gunhangje Festival was held from 1-10 Apr 2017 so we were there on the first day. There were lots of flowers and some were already in full blossom.